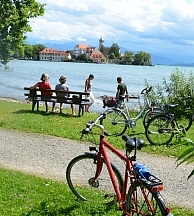 Bavaria, Lake Constance, the Danube river valley – Germany’s stunning lakes, rivers and smart spa towns, green alpine valleys and magical mountain views make for superbly scenic cycling holidays. 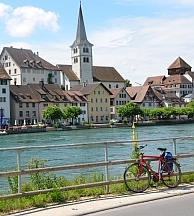 Country hop around the ‘Bodensee’ and see the dramatic Rhine Falls. Sample Bavarian hospitality from musical Munich across to Mozart's Salzburg. Or head to Passau, Germany’s borderland 'City of Three Rivers' and gateway to Vienna, Bratislava and Budapest, for a taste of Europe’s most classic cycle route along the mighty meanders of the Danube. Our self-guided cycling breaks in Germany feature both linear and circular routes and include hotel to hotel, single centre cycling tours plus bike and boat holidays.